Aeroseal: Saving You Money From The Inside Out. Source: Comfort Institute. Based on Department of Energy Research and FL Energy Office Research Report: FSEC-CR-397-91 Degradation above is typical. Impact is up to 50% greater on AC performance if return air leakage is from a hot attic or attached garage. Impact is typically 50% to 100% greater on winter heating performance of a heat pump with electric resistance auxiliary heat. About 30 cents of every heating or cooling dollar you spend is literally leaking away. Tiny leaks in your ductwork can allow warm and cool air to escape, causing your heating and cooling system to perform at a much lower efficiency rating. Worse yet, these leaks can also spread mold, dampness and contaminated air throughout your home or business. Whether it's your home or your workplace; an older structure or a newer one, leaky ducts could be a major problem. But A.J. Michaels has the answer. It's Aeroseal®: a high-tech solution developed by the University of California Berkeley. And it works for residential and commercial buildings. And, A.J. 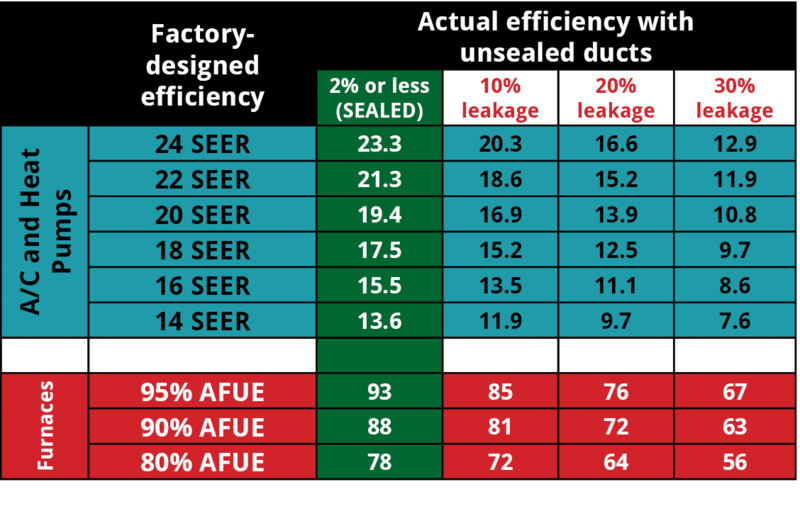 Michaels can save you up to $750 off on duct sealing when combined with a home energy audit and home performance shell measures. 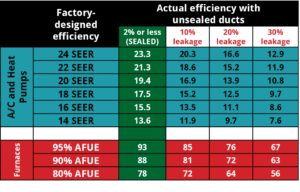 The Aeroseal process starts when we measure the amount of leakage in your ductwork. Then we run high-pressure air through the system, pumping thousands of tiny polymer particles into the ductwork. These particles stick to the edges of the leaks, and to each other, sealing off the escaping air — even in hard-to-reach areas concealed by walls or ceilings. The result? Your system becomes more efficient. You'll be more comfortable. Your energy bills will go down. How effective is it? We guarantee every Aeroseal job for 10 years. There's no doubt about it. The entire process can be completed in one day. A.J. Michaels is the only contractor in the Baltimore-Annapolis area licensed to install Aeroseal and has four years of experience. In Baltimore call 410.435.5400, in Annapolis call 410.573.5858 or fill out the form on the right to schedule a home energy audit or free estimate for Aeroseal.